For those of you interested in US foreign policy, Scahill’s book is a must read. He examines the nature of our military and paramilitary operations overseas, with an emphasis on JSOC (Joint Special Operations Command) and three-letter agencies. As a former special operations pilot, I have personal knowledge of some of the events he writes about. Scahill has been fortunate enough to gain access to credible information, and his reporting is both thorough and accurate. You will read about US military presence and recent history in countries around the world…places where our government is waging dirty wars behind the scenes (propping up ‘useful’ governments, fomenting revolutions in others, assassinating US citizens without trial, etc). It is scary to read about, but also enlightening. You will become more aware of our actions in other countries, and this will shed some light on why many people around the world resent our interference. Even with the best of intentions (which is a stretch in this case), there are unintended consequences when you bring violence, fear, and destruction with you. While it’s not a particularly encouraging book, “Dirty Wars” is incredibly informative and useful for anyone who wants to educate themselves on what the US government is doing abroad. 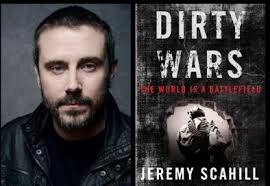 Scahill has done excellent work, and I commend his efforts to expose a corrupt system that has implications for us all.